Greater disturbances in sensorimotor control have been demonstrated in younger to middle aged groups. However, it is unknown whether or not the impairments documented in these populations can be extrapolated to elders with neck pain. The aim of this study was to investigate the influence of neck pain on sensorimotor function in elders. Twenty elders with neck pain (12 women and 8 men) and 20 healthy elder controls (14 women and 6 men) aged 65 years and over were recruited from the general community. 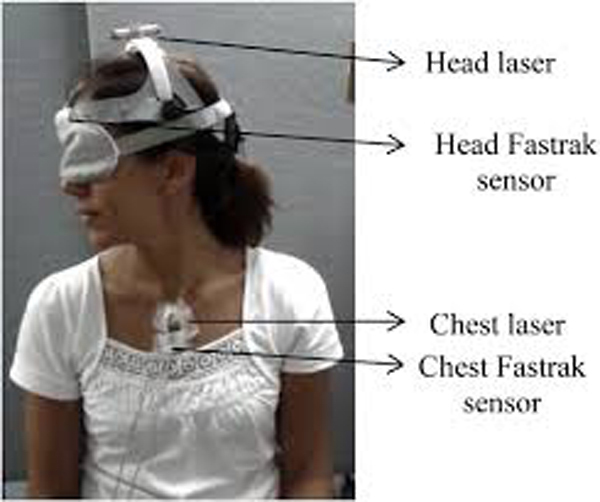 Tests for sensorimotor function included; cervical joint position sense (JPS); computerised rod-and-frame test (RFT); smooth pursuit neck torsion test (SPNT); standing balance (under conditions of eyes open, eyes closed on firm and soft surfaces in comfortable stance); step test and ten-meter walk test with and without head movement. Elders with neck pain had greater deficits in the majority of sensorimotor function tests after controlling for effects of age and comorbidities. Significant differences were found in the SPNT (p<0.01), error in the RFT (frame angled at 10° and 15° anticlockwise) (p<0.05), standing balance (amplitude of sway) – eyes open on a firm surface in the medio-lateral (ML) direction (p=0.03), and total number of steps on the step test, both left and right sides (p<0.01). Elders with neck pain have greater sensorimotor disturbances than elders without neck pain, supporting a contribution of altered afferent information originating from the cervical spine to such disturbances. 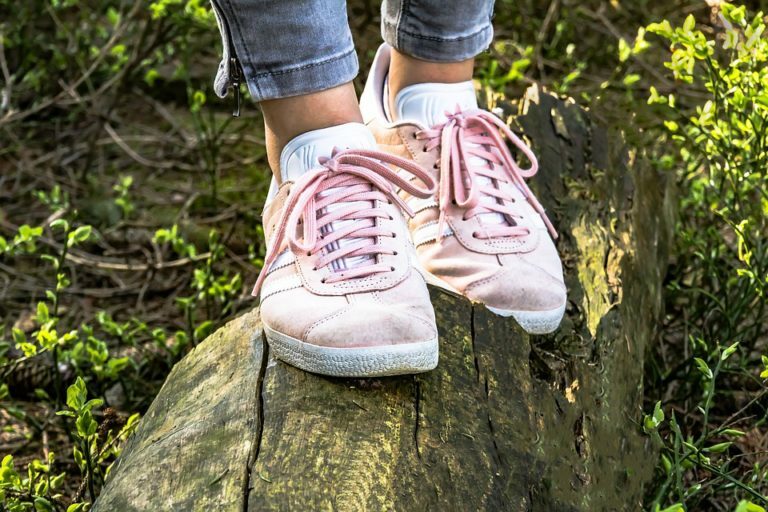 The findings may inform falls prevention and management programs. BACKGROUND: Several studies in recent decades have examined the relationship between proprioceptive deficits and neck pain. However, there is no uniform conclusion on the relationship between the two. Clinically, proprioception is evaluated using the Joint Position Sense Error (JPSE), which reflects a person’s ability to accurately return his head to a predefined target after a cervical movement. OBJECTIVES: We focused to differentiate between JPSE in people with neck pain compared to healthy controls. STUDY DESIGN: Systematic review according to the PRISMA guidelines. METHOD: Our data sources were Embase, Medline OvidSP, Web of Science, Cochrane Central, CINAHL and Pubmed Publisher. To be included, studies had to compare JPSE of the neck (O) in people with neck pain (P) with JPSE of the neck in healthy controls (C). RESULTS/FINDINGS: Fourteen studies were included. Four studies reported that participants with traumatic neck pain had a significantly higher JPSE than healthy controls. Of the eight studies involving people with non-traumatic neck pain, four reported significant differences between the groups. The JPSE did not vary between neck-pain groups. New Haven, CT 06520-8071, USA. Clinical reports and research studies have documented the behavior of chronic low back and neck pain patients. A few hypotheses have attempted to explain these varied clinical and research findings. 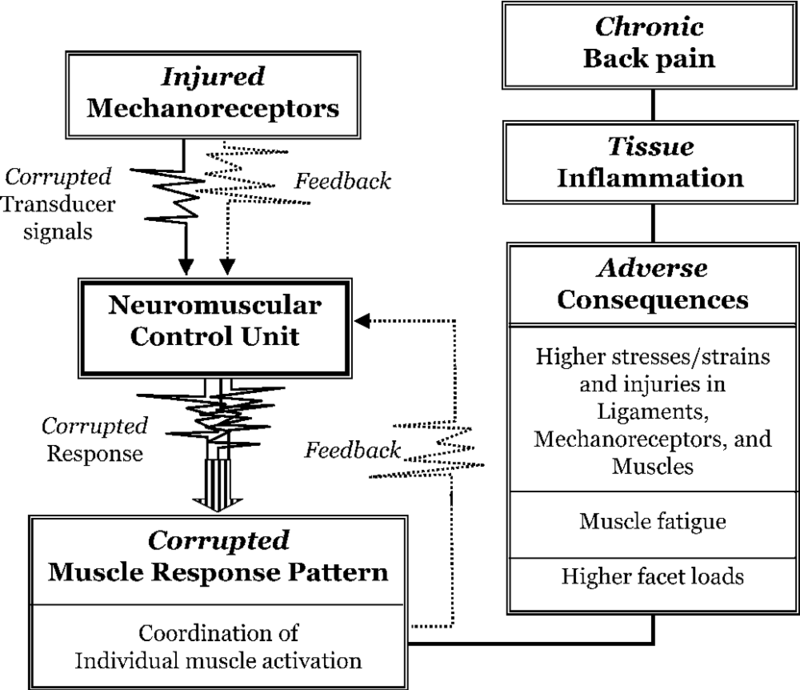 A new hypothesis, based upon the concept that subfailure injuries of ligaments (spinal ligaments, disc annulus and facet capsules) may cause chronic back pain due to muscle control dysfunction, is presented. The hypothesis has the following sequential steps. Single trauma or cumulative microtrauma causes subfailure injuries of the ligaments and embedded mechanoreceptors. The injured mechanoreceptors generate corrupted transducer signals, which lead to corrupted muscle response pattern produced by the neuromuscular control unit. Muscle coordination and individual muscle force characteristics, i.e. onset, magnitude, and shut-off, are disrupted. This results in abnormal stresses and strains in the ligaments, mechanoreceptors and muscles, and excessive loading of the facet joints. Due to inherently poor healing of spinal ligaments, accelerated degeneration of disc and facet joints may occur. The abnormal conditions may persist, and, over time, may lead to chronic back pain via inflammation of neural tissues. The hypothesis explains many of the clinical observations and research findings about the back pain patients. The hypothesis may help in a better understanding of chronic low back and neck pain patients, and in improved clinical management. OBJECTIVE: The objectives of this study were to investigate whether elbow joint position sense (JPS) accuracy differs between participants with a history of subclinical neck pain (SCNP) and those with no neck complaints and to determine whether adjusting dysfunctional cervical segments in the SCNP group improves their JPS accuracy. METHOD: Twenty-five SCNP participants and 18 control participants took part in this pre-post experimental study. Elbow JPS was measured using an electrogoniometer (MLTS700, ADInstruments, New Zealand). Participants reproduced a previously presented angle of the elbow joint with their neck in 4 positions: neutral, flexion, rotation, and combined flexion/rotation. The experimental intervention was high-velocity, low-amplitude cervical adjustments, and the control intervention was a 5-minute rest period. Group JPS data were compared, and it was assessed pre and post interventions using 3 parameters: absolute, constant, and variable errors. RESULTS: At baseline, the control group was significantly better at reproducing the elbow target angle. The SCNP group’s absolute error significantly improved after the cervical adjustments when the participants’ heads were in the neutral and left-rotation positions. They displayed a significant overall decrease in variable error after the cervical adjustments. The control group participants’ JPS accuracy was worse after the control intervention, with a significant overall effect in absolute and variable errors. No other significant effects were detected. Objectives. Studies have shown decreases in N30 somatosensory evoked potential (SEP) peak amplitudes following spinal manipulation (SM) of dysfunctional segments in subclinical pain (SCP) populations. This study sought to verify these findings and to investigate underlying brain sources that may be responsible for such changes. Methods. Nineteen subclinical pain volunteers attended two experimental sessions, SM and control in random order. SEPs from 62-channel EEG cap were recorded following median nerve stimulation (1000 stimuli at 2.3 Hz) before and after either intervention. Peak-to-peak amplitude and latency analysis was completed for different SEPs peak. Dipolar models of underlying brain sources were built by using the brain electrical source analysis. Two-way repeated measures ANOVA was used to assessed differences in N30 amplitudes, dipole locations, and dipole strengths. Results. SM decreased the N30 amplitude by 16.9 ± 31.3% (P = 0.02), while no differences were seen following the control intervention (P = 0.4). Brain source modeling revealed a 4-source model but only the prefrontal source showed reduced activity by 20.2 ± 12.2% (P = 0.03) following SM.